A healthy Treat or a Healthy Meal? Water is an extremely important nutrient with respect to a dog's overall well-health. 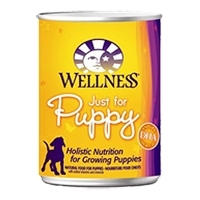 Packed with the same whole food nutrition as with Wellness Super5Mix dry formulas, these canned foods are a delicious way to increase your dog's moisture intake. Use as a special treat or as part of your regular feeding regime. Wellness canned foods are yet another delicious way for your dog to eat healthy!